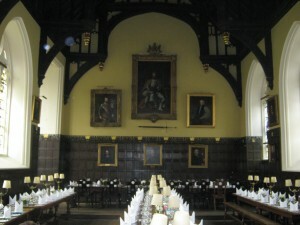 All I could think about when I was at Oxford was: “what a privilege”. What a luxury it must be for the students that come here, to be in a university which is in the top ten best universities in the world, to be a Rhodes scholar. 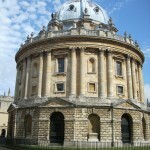 Not that I do not appreciate the education I receive, but Oxford University is the most idyllic place I have ever seen. When looking at the gardens of the beautiful colleges, the bikes, the lovely stone buildings, I could almost see the students from the 18th century discussing their ideas at the quad, wearing tweed jackets and going punting in the river. Of course, this privilege has, traditionally, only been enjoyed by those that grew up privileged. Most of the students at Oxford attended what we know as private schools. This is something else I learnt about England: state schools are what we consider to be private schools. Yes, it’s really complicated. But as I was mentioning, admissions to Oxford still continue to be controversial, specially after the Laura Spence Affair in 2000. Spence was a state public school student who had perfect grades in all of her GCSEs and A-levels, something that would secure her a place in Oxford for sure, but in the end, did not get in. Oxford said that it was because she did not show potential, but people say it was really because of her northern England working class and state-school background. Finally she ended up getting into Harvard with a full scholarship. However, I realize that, in the end and in the long run, it doesn’t really matter whether education is very expensive, or for free. Higher education is a right and not a privilege in many countries, yet there is many people who just cannot afford the time to go to university and need to start working instead. A student has to be able to afford the time to study. On another note, I think it will be interesting to compare Oxford with UEA later on, specially because, as I understand it, they have very different structures as institutions of higher education. After visiting two different temples and observed two different cultural groups in their own religious institutions, we must wonder, how are we going to think of them? We must now think about our small overt participant observation because the politics of representation are extremely important. Our impressions of Catholicism, Sikhism and Hinduism should not the participants, the Other, as exotic, or a romanticized version of them. Although it is true that we are always somewhat biased, we can make the effort of being less so by informing ourselves, carefully listening, and above all, observing in a critical way. Karl Marx once said that religion is the opium of the people. Anthropology however, has said that while religion is a social institution that appeals to every individual in a society, each one at the same time makes his or her own meaning of religion. Religion, as a component of culture, that is, the practice of beliefs, is always changing. It adapts to the passing of time, and especially to globalization processes. England is one of the best examples to understand how cultural practices adapt in a different way when in a different country. What I considered to be the most valuable lesson of the whole experience, is actually proving by looking these places of worship, that different religions, from a sociological standpoint, are the same. On the last three days here in London, we saw how religion has moved many people throughout the centuries, starting in Oxford University, the birthplace of the British academia, which was founded by monks, and where every College had its own chapel. 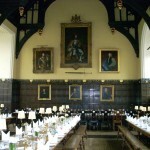 To this day, the chapel of your college remains the most important place of congregation if you are a student at Oxford. Even in what we consider the “secular Western world”, religion is still very much important. In the case of the Sikh and Hindu temples, what struck me the most were our guides. The discourse was so alike in so many ways. It always amazes me how every religion claims to provide the ideal lifestyle, and to appeal to everyone across society, and to be the most comprehensive one. It is clear that every people wants to be “the chosen people”. Some people think that we are always biased. Following many social scientists, I will claim that we must locate ourselves in the context in which we are observing our subject and not think that our experience can be representative of The Sikh, or The Hindus. Who are these guides? What has their experience been with their religion? Would we be observing different cultural practices in a Hindu temple in Nairobi or some other city in another country? In that sense, I wish we could have learnt more about how the cultural practices of these religions have adapted in time, and to the city of London. But for that, further research would be required. There will never be complete peace and unity with a community. Unfortunately, the same is true for a religious group. There will always be arguments between the more orthodox members of the society and how they interpret scripture, rules, or messages, and the younger generation that was raised in a very different world from their predecessors. In some cases, these arguments lead to forward progress for the religion as a whole, for example with more equality for women or more opportunities for all members of the congregation. However, just as often if not more so, this can lead to divides and people leaving the faith altogether. In many ways Sikhism and Hinduism are very similar. Both religions believe that shoes should be removed before entering the inner sanctum of the temple, that peace is a necessary force in life, that donations and charity will hold you in higher stead with the god(s), and that life is a journey to learn from. However, when observing the people at the Sikh and Hindu temples I discovered another thing that both religions prize – children. There was a definite sense that the children were learning to respect their religions from a very early age. In the Gurdwara I saw a little girl of about 4 tying a headscarf onto her squirming little brother. Obviously this girl had learned that in her faith, covering your head is necessary inside of the temple. In the Hindu temple, many young children went up to their parents to get change to offer to a particular deity in prayer. The other thing that struck me as interesting was how the Sikhs and Hindus have adapted to being in the United Kingdom. Some changes are quite obvious, the Sikh men cannot carry their defensive swords due to British law. However, it is interesting to consider that some Sikhs have been forced to remove their head-covering or trim their facial hair due to the parameters of their jobs. The changes for the Hindus are not as obvious. It is, of course, possible that some Hindus have rejected the idea of obstaining from meat and fish since entering the UK, but that doesn’t seem to have the same direct correlation as with the Sikhs and their changes. In many ways, this links directly to the Sikhs and the Hindus. Both are being forced to adapt to their surroundings, both religiously and culturally, in Britain; some as second-generation immigrants who believe in their religion to a degree and others as die-hard orthodox followers. In order for their religion continue to have forward progress, these people need to sort out their differences long enough to come to a consensus. I hope my Church will do that too. 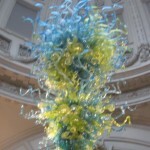 No museum has affected me as viscerally as The Victoria and Albert Museum in South Kensington. Immediately upon entering the museum I was struck by the sight of life-sized Rodin sculptures of the human body that were raised above eye level, which created, for me, a sense of the insignificance of the appreciator, and likewise, the importance of art over all things. These sculptures were grotesque; Rodin used a technique that rendered them black and raw-looking, as if they had once been alive and thrown into a fire, then the charred remains removed and put on display. Though they were shocking and somewhat disturbing, Rodin’s pieces elicited in me a very emotional response, one that cut to the core of my perceptions of the self and of humanity, and one that I can neither explain nor recreate for the reader. I also really enjoyed seeing several sculptures by Alfred Stevens, including a copy of the original “Truth and Falsehood” which is a part of The Wellington Memorial which we saw at St. Paul’s Cathedral several days ago. The fashion and jewelry exhibits at the Victoria Albert were equally as touching, but for different reasons. Coming from a background in feminism, I was disappointed in those women who conformed to societal ideals of beauty – women who cinched their waists and bustled their butts, weighing themselves down with heavy jewelry, changing and shifting and molding themselves to ‘fit,’ quite literally, into the beauty myth. 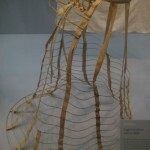 One display featuring a bustle and the wooden innards of a hoopskirt were reminiscent of a cage. And would it really be so far from the truth if it were? Another exhibit which really hit me was photography. A great little exhibit, though I do wish it were larger. I thought that all of the works were quite good, though I connected on a deeper level with just two prints. The first piece was strikingly different. 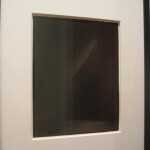 The artist worked with the principles of light and photography and used the sun to burn a simple design into the photo paper. I didn’t quite understand the process by which the piece was created but that’s the beauty of art, isn’t it? You don’t always have to understand it, or at least understand it as the artist does. 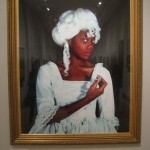 One piece that I definitely took a bit of “viewer’s license” to form my own interpretation was a photograph of a beautiful black model in a traditional Georgian dress and wig – both stark white. In her delicate hand she held a large diamond, perfectly cut and gleaming. Her head tilted towards the diamond in her hand, yet her eyes remained fixed intently on the camera. I thought that this piece, out of all the pieces of artwork I have seen at any exhibit thus far, had the most to say. It powerfully conveyed, by capturing just a single moment in time, hundreds of years of British imperialism and the pain it caused the imperialized. The Africans and West Indians were brought to perhaps not-so-‘Great’ Britain and taught that being ripped from their homelands like so many weeds was a privilege. They drowned the enslaved in western culture, which is represented by the model wearing the white (this was surely no mistake) Georgian garb, and meanwhile robbed their homelands of natural resources – such as diamonds and gold – for their own profit. “Has imperialism, has slavery, really ended?” one must ask him or herself when one considers that there are still related issues in today’s society. The answer should become glaringly apparent when one considers Westerners’ continued thirst for diamonds. Though our presence in the diamond mines of Africa, in places like Sierra Leone, The Democratic Republic of Congo and Angola, may not be physical, our socially-sculpted ideologies surrounding the institution of marriage perpetuates these issues, and exacerbates the problems surrounding blood diamonds. So, for all you ladies out there: next time you stare doe-eyed into a Zales’ display window and exclaim in “I can’t wait to get married!” think twice about what societal forces and social constructions may be at work when you consider the “necessity” of an engagement ring. And the next time you look at a piece of art, everyone, look a little deeper and listen a little closer to what the piece may be trying to say. There were many things I adored about the V&A museum: the entrance way of marble Greek sculptures, the fashion wing including one of Princess Diana’s dresses. But what took my breath away the most was the fairy tale exhibit, Telling Tales. As many of you know, I have a childlike obsession with fairy tales and Disney movies, especially the Little Mermaid. But it is not the Disney story or the catchy songs that make me love these stories even as the years go by, but rather the way that these stories can transform a young child’s hopes and dreams into a story that suspends reality. These stories create a new world where children can hide for a little while. Who wouldn’t love that? Well the Telling Tales exhibit at the V&A museum did just that: suspend reality and take the audience into a magical fantasy world. 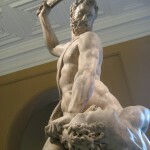 The works of art on display were amazing manifestations of the classical fairytales in furniture and sculpture. But that was not even the best part of the exhibit, rather it was the way that entire space was like a fairytale. Each room followed a different theme: the forest glade, the enchanted castle, and heaven and hell. To say that each of these rooms’ atmospheres matched their titles would be an understatement. When I entered the first room, the enchanted forest, all the walls and lighting matched that of a forest. It was likewise for each room. With this, the exhibit was able to achieve exactly what a fairytale is meant to: suspend reality. The V&A museum mostly deals with exhibitions about design. Besides the suspension of reality, this show captures the elements of fairytales: dreams, hope, fear, beauty, and of course happy endings. Although the exhibit ended darkly with the heaven and hell room, I think in this way it remained grounded in realtiy. Afterall, we are not in a fairytale. And eventually the suspension of reality ends. And what better place to end it than with death, where everything ultimately ends? Note: Photo slideshow of the V&A museum to come soon. 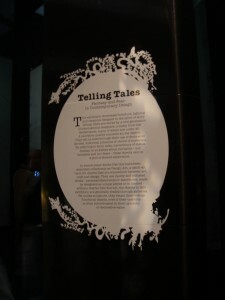 However the Teling Tales Exhibit did not allow photography inside. When people hear the word Oxford, they think of a very selective and highly demanding school. And it’s true; the University of Oxford is an elite institution. 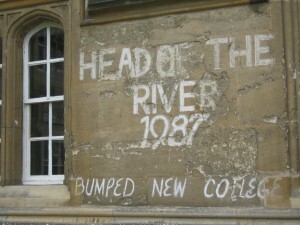 However, Oxford usually doesn’t conjure up images of the town itself. I will not deny that parts of the town were beautiful, but many parts were a bit too touristy. At certain points throughout Oxford I felt as if I was just walking through a series of strip malls. Such sights were not what I expected Oxford to look like at all; instead I thought I would be seeing just a picture perfect small college town. On top of this, those “lucky” enough to have been with a certain tour guide are aware of how boring Oxford can be made to be. I know our tour guide had the best intentions, but the manner in which he toured us around Oxford made me want to fall asleep. If that is a glimpse of the Oxford experience, I’ll gladly take Dickinson. Something I found particularly interesting was how hostile the university was to the sciences. Having a completely separate science library so that it wouldn’t “infect” the classical studies of the students is fascinating. Though it does make sense now that I think about, I still believe that such an attitude shows just how far we have progressed; science is no longer seen as an enemy (at least by those who can actually think on their own). In the end, the University of Oxford was truly an awesome experience. Though the tour guide was a bit boring, he still explained the history very well (and made us ponder the universe and infinity). I only wish the town of Oxford itself was less touristy and less ritzy. So arriving in London two weeks ago I have dove into a world of museums, churches, and recognizable landmarks (some of these locations encompassing all three of these aspects; ie. Westminster Abbey/St Paul’s ). As I read my other classmates blogs about these locations I was less than inspired though to throw my two-sense into the conversation. However after visiting the Sikh gurdwara I realized that discussing the architecture or the history of these churches was not what I was interested in. Rather, my focus was on the spirituality and religious nature of these locations (or lack there of as the case may be). I’d be crazy not to acknowledge Westmnister Abbey’s incredible architecture– the dedication to style as additions were made to the building, the multitude of famous persons from his or her particular field buried in the ground of the building. I had the same reeling of awe walking around St. Paul’s Cathedral. The detailed stained glass windows, the enormous dome, the ceremonial burial sites all over the building—they are images I will remember forever. However, as I left both of those places I felt more like I was leaving a museum than a church. Because of this feeling I decided to stay at St. Paul’s for evening song. It was a beautiful service, but I continuously found myself distracted by the other tourists walking up and down the church looking at all of the graves. I hoped that I would find myself in a state of spiritual prayer, but only found myself frustrated. I had a similar reaction when I sat in on Holy Communion at Bath Abbey. Sitting in another beautiful church, trying to take in and appreciate the holiest of sacraments and all I could focus on was the people going in and out of the attached gift shop. While also in Bath I decided to wander down random alleys exploring the city. It was here where I ran into St. John the Evangelist, a Roman Catholic Church. Being the first Catholic church I had seen since arriving I decided to go in. Assuming to find myself surrounded by graves and gift shops yet again, I was in disbelief to find myself in one of the most beautiful churches I have ever seen. No gimmicks. No crowds. Beautiful architecture. Amazing stained glass. And peace. I couldn’t even tell you how long I just sat there, engulfed in the church’s beauty and feeling of spirituality. When I attended St. Patrick’s in SOHO for a service I hoped I would feel the same sense of peace I did in Bath, but was slightly disappointed not to. I’m not sure why, but I’m hoping as I continue to investigate churches in both London and Norwich I will find a common thread in why I find some churches and temples more spiritual than others. I believe Brandon and I have won the award for worst bird poop incident. Not only did we have bird poop on us the entire day, it was like freaking Niagara Falls bird poop, splattered everywhere….. and my sweater is dry clean only.. stupid bird. When I first sat down to write this post, I thought my views on identity were simple. Simple meaning; you are who you are, don’t throw a fit, its easy, kind of simple. After I realized I had virtually nothing to write about, I figured I needed more time to allow myself to further my knowledge on what identity is. This time around, after viewing what I though may help my argument, (the Sikh and Hindu Temples), I have gained some understanding of what identity is. It is apparent that, the search for and loss of identity reflects entire generations in the city of London. The book Salam Brick Lane is a perfect example of the diverse population attempting to search for a British identity while also trying to grasp their own at the same time. It seems as though Londoners want immigrants to assimilate into their culture. Does this mean, then that once a man from India, of darker complexion, who works in the city, goes to fun pubs at night, and lives in an upscale neighborhood, in other words “assimilated”, can only identify now with British culture? For that matter, if one does do these things, is he/she unable to identify with their original culture? The two temples we saw represent how immigrant populations have migrated to an area where they can openly worship a religion brought from another country. In these temples we saw people who practice a very strict form of both Hinduism and Sikhism but we also saw those who dare to use the term, “more westernized”. We see these people worshiping in street clothing and we know it is their choice, but how do they feel? Do they feel trapped within one culture, or do they feel as though they want both? I guess what I am trying to argue is that identity can not be defined by another person. As a matter of fact, identity can just as easily never be defined. It is ones choice to have an identity and it is also their choice to not. The real issue involves the ways in which a country handles an immigrant populations decision to choose their identities meaning, they have to allow each individual to make the decision. I am an America. I descend from Germany, Ireland, Scotland, and England, but me, myself, and I, am an America. But, if I ever choose to move to England or another country, I would hope that my identity would be at liberty to alternation based on who I want to be and who I choose to identify with.